What a warrior! 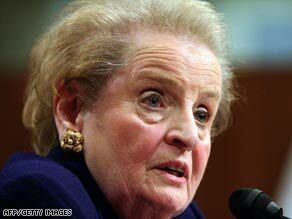 Now, we know that Mrs. Albright is not necessarily a hard-line evangelist, but, boy, she called it out recently. I think we do that now at our own peril. Religion is instrumental in shaping ideas and policies. It’s an essential part of everyday life in a whole host of countries. Can it get any more plain that that? You or I can say stuff like that all day long, but when Mrs. Albright calls it down on the mat, someone has GOT to listen. Many believers from any religion know that personal spiritual beliefs are actually leading all nations, so why do our leaders continue to act as if there ever really was such a thing as separate of church and state? Tolerance. Bah! What began as tolerance ended up throwing out any theological foundation for this country. Regardless of that insurmountable obstacle (I will let somebody else debate it), read the article and give us your feed back! Why must my senses be bombarded by such things?! Driving to my favorite coffee shop this morning, I pass by the local Hooters bar. What do I see? No, not hooters! I see on the sign that it refers to Fantasy Football. Was football not an insane-enough time-waster? Have we already grown so numb to sweaty men throwing themselves at high velocity into other men that we have to have Fantasies of them doing so? It turns out, if you don’t already know (if you do, just don’t admit it), Fantasy Football is when people make picks of players throughout the entire NFL and build their ideal Dream Team. Then, the stats are calculated at the end of the week to see whose pick is winning. Was picking the best real team not enough? Do we have enough arm-chair quarterbacks that think they can do better? Then, the biggest question of all: who would waste THAT MUCH TIME on an imaginary world that does NOT EXIST??? It got me to thinking though. Where ARE the Christians out there? Where are the Christians who would spend as much time at the mission as they would at Fantasy Football? It was a stark contrast in my mind. The fact that so many people in America can find time to invest in making up teams, tracking stats, and winning money on teams that don’t exist blows me away. Then compare that to the number of Americans who claim to be Christian and can’t find the time for the mission. This totally blows me away. I am curious what you all think about this topic. I got in a rather heated debate with someone who was obsessed with progressively getting people into the Kingdom. I said that our only goal was to deliver the message of Jesus Christ. We went ’round and ’round about it, but what do you think? Simply deliver the gospel to everyone in the world? This would alter the approach to ministering and that would exactly entail. What do you think is right? E-mail or post your response here. You are currently browsing the Christian Crunch blog archives for August, 2007.